When you have tomatoes that are at the peak of their flavor, you’ll want to treat them as simply as possible. That means: preparations like panzanella, as an uncooked pasta sauce or in a quick confit. In this way, you’ll be able to savor their sun-tinged sweetness, which in some cases, can substitute for candy. Preserved lemons are whole lemons that are immersed in lemon juice and a healthy amount of salt, sealed in a jar and left to sit for about a month or longer. You can make them yourself, or buy them ready-made at any specialty-food shop wherever you’re located. This combination of acid and salt transforms the rind into a tart and piquant treat that lends spark to salads, sandwiches, steamed vegetables or even pasta. *You don’t need to use Meyer lemons. Regular lemons will do. It’s just that the milder Meyer lemons work very well for preserving in this way. **You probably won’t use all of the salt, but it’s good to have this quantity on hand if necessary. ***Elise uses a quart canning jar in her recipe. Given that I live by myself, I tend to use smaller quantities as I’m cooking for one person, usually. My adaptation has been sized for roughly a 15-oz. jar. One by one, prepare the lemons in the following way. Cut off any protruding stems from the lemons, and cut 1/4 inch off the tip of each lemon. Cut the lemons as if you were going to cut them in half lengthwise, starting from the tip, but do not cut all the way. Keep the lemon attached at the base. Make another cut in a similar manner, so now the lemon is quartered, but again, attached at the base. Pry the lemons open and generously sprinkle salt all over the insides and outsides of the lemons. Pack the lemons in the jar, squishing them down so that juice is extracted and the lemon juice rises to the top of the jar. Add the black peppercorns, if you wish. Fill up the jar with lemons. Make sure that the top is covered with lemon juice. Add more fresh squeezed lemon juice if necessary. Top with a couple tablespoons of salt. Seal the jar and let sit at room temperature for a week, in a cool, dry place. Turn the jar upside down occasionally. Put in the refrigerator and let sit, again turning upside down occasionally, for at least 3 weeks, until lemon rinds soften. Preheat oven at 300 F.
Combine the tomatoes, olive oil, sea salt and black pepper in a bowl. Mix well. Spoon tomatoes into a Pyrex baking dish. Roast at 300 F for 90 minutes. During the last 30 minutes of cooking, take out the baking dish with a pair of kitchen mitts. 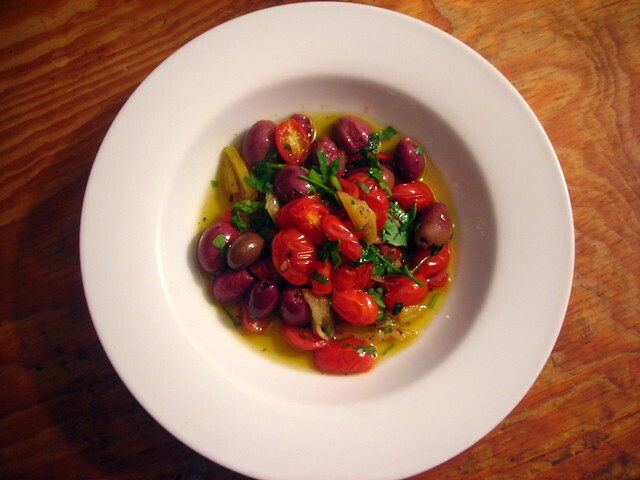 Stir in the olives, making sure to coat the olives with the tomato mixture. Return the dish to the oven to finish roasting. To assemble: Spoon the tomato confit onto a shallow bowl or plate. Top with slivers of preserved lemon rind and minced herbs. Serve immediately. Time: About 2 hours for the tomato confit and roasted olives, including prep. Homemade preserved lemons require at least 4 weeks time; store-bought is perfectly fine though. 12 Aug	This entry was published on August 12, 2013 at 9:35 am. It’s filed under American cuisine, food, food photography, Gluten-Free, summer, vegan and tagged American cuisine, appetizer, food photography, gluten-free, lemon, olives, summer, tomatoes, vegan. Bookmark the permalink. Follow any comments here with the RSS feed for this post. 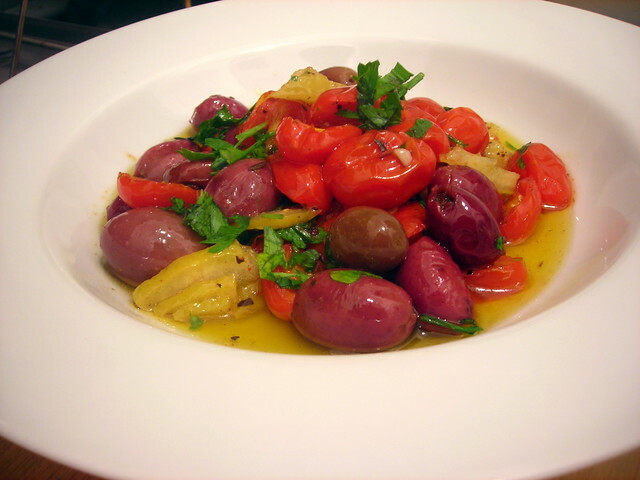 You had me at “roasted olives!” This looks amazingly delicious!